According to insurance companies, washing machine related failures are one of the top 10 leading sources of residential claims. You can protect yourself from a flooding disaster by taking some simple preventive steps. The life span of rubber hoses are impacted over time by the bend in the hose, water pressure, chemicals and minerals naturally found in water. These chemicals can easily corrode and rust the light metal coupling, inside and out. The corroded insert inside the hose becomes jagged and sharp. The washing machine’s vibration, movement and constant water pressure causes the jagged leading edge of the insert to gradually cut through the hose’s inner tube, allowing the pressurized water to escape and migrate between the tube and outer cover, forming a bubble. When that eventually that bursts, you could end up with an expensive mess to cleanup. With 70 pounds of water pressure, a burst washing machine hose could dump approximately 2271 litres (600 gallons) of water per hour into your home. With this water weighing in at 2268 kilograms (5000 lbs), you can only imagine the damage this happening while you’re sleeping,away for the weekend, or on vacation for several days or weeks. Many washing machine manufacturers caution owners to shut off the washer water supply when not using the machine and to replace the hoses regularly every 3-5 years. Check your manual! One good option is to install braided supply lines. 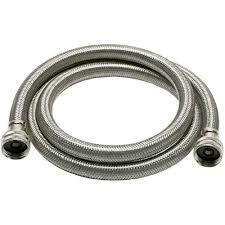 Stainless steel braided washing machine hoses are encased in a woven metal sleeve that help prevents weak spots in the rubber from developing into leaks. They are much more resilient and last longer. They can be purchased at most DYI home centers, hardware and plumbing supply stores. They can be more resistant to any cuts or twists in comparison to the rubber hoses. Check all your appliance hoses frequently and replace them at any sign of wear!